The U.S.S Midway is a decommissioned United States Navy aircraft carrier, she was commissioned a week after the end of World War II. 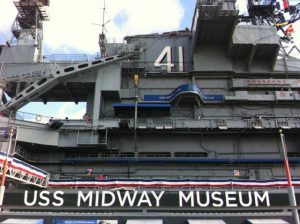 The U.S.S Midway was the largest tonnage ship in the world until 1955. She served for an unprecedented 47 continuous years, saw action in the Vietnam theater, and was the flagship in 1991′s Operation Desert Storm. 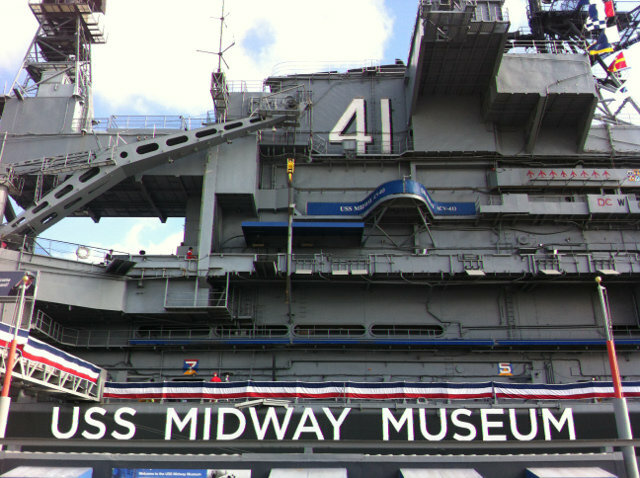 Decommissioned in 1992, she is now a well trafficked museum in San Diego, California, and the only remaining (non Essex class) U.S. aircraft carrier of the World War II era. Besides her obvious historic and patriotic importance the U.S.S Midway has gained the very quiet reputation of being haunted. Specifics of the haunting are being kept, “very close to the chest,” among volunteers and staff. Online reports from non specific sources claim, “the USS Midway has a great deal of paranormal activity onboard, with over 30 ghosts/spirits having been recorded in the last five years. The ship does not promote its haunted side, so much of this info will be new to the paranormal community. The ship was listed and discussed as one of four haunted ships at the 2012 Maritime Ghost Conference in San Diego. The only paranormal group known to have had a sanctioned investigation was the San Diego Ghost Hunters.